Let’s be honest. How often do you think about your garage door? We’re willing to bet your answer is somewhere between “why are you asking me this?” and “not very often, as long as we’re being honest.” To most people, the garage door is simply that steel wall on one side of the house that goes up when you press a button. But Bob and Deb Meaut are thinking about your garage door. They’re thinking about how one quick and easy installation can have a million-dollar impact on your home’s curb appeal. They’re thinking about how the next time a Matthew-type storm comes to town, your garage door could be the only thing standing between your home’s interior and the roaring hurricane winds. They’re thinking about how just a little bit of insulation in the right spot can turn your garage into additional living space. But more important, they’re thinking about your satisfaction as a customer. Because since day one, that’s been Hilton Head Garage Door’s driving ethos. It’s not just your standard “the customer is always right” boilerplate, either. They have the scores to prove it, with five-star ratings on Angie’s List, HomeAdvisor and American Home Shield. They’re listed as a top contractor on AHS, and are ranked in the top 5 percent nationally on Angie’s List for customer service. For the Meauts, its validation of a customer-first work ethic they established when they started the company in 2003. 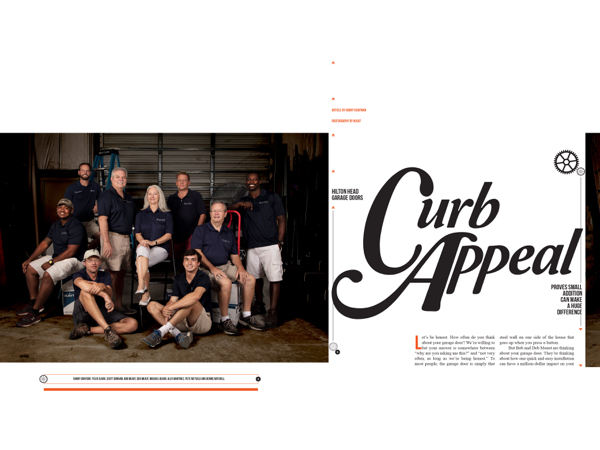 Starting out of, appropriately enough, their garage, the couple began installing and repairing garage doors primarily in Sun City before working their way to Hilton Head Island and Beaufort. Before long, they were putting in an additional building on their property’s six acres to accommodate their burgeoning business. This past July, they finally ran out of space in their home office and upgraded to an exquisite 4,000-square-foot space in Riverwalk with a showroom, office space, warehousing for all their many products and space for their fleet of five trucks. It’s here you can see some of the many options available to take your garage door to the next level: expansive doors with composite covers offering the look and feel of real wood with none of the upkeep, retractable screens that let you quickly convert your garage to a lanai, openers that silently raise your garage door with a tap of your smartphone…. If it can transform your garage into something exciting and unexpected, you’ll find it here. 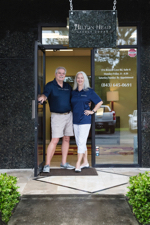 Bob and Deb Meaut welcome you to their showroom in ridgeland at 516 browns cove road, suite k. or call them at 843.645.0691 to schedule an appointment. And beyond giving your house a slick new look, the doors Hilton Head Garage Doors sells go above and beyond in protecting your valuables in the event of a storm. “The Weather Channel did a study showing that when a roof was lifted off the house during a wind storm, 80 percent of the time it started at the garage door,” Meaut said. Some of the doors Hilton Head Garage Doors sells, such as the Raynor Relante, are rated to withstand gusts up to 170 mph. That’s above and beyond the current 130 mph requirements for new construction. And speaking of insulation, how would you like to turn that garage into your next mud room, game room or man cave? Good luck in the Lowcountry, where the boiling heat of summer and the just-cold-enough-to-be-uncomfortable temperatures tend to coalesce in the garage. Unless you’re properly insulated, of course. “Our doors are insulated anywhere from R5 to R20,” Meaut said, noting that walls around here are rated around R13. The point being, with the right garage door you could add tons of livable space to your home. After all, whether you’re putting your washer and dryer in there, your workbench or maybe even a pool table, who actually parks their car in the garage anymore? But beyond selling and installing transformative garage doors, Hilton Head Garage Doors also offers top-notch service work, repairing everything from cracked doors to broken springs. And they do it with the kind of dedication to customer satisfaction that has helped them earn every one of those glowing five-star reviews and Facebook testimonials. Find out more at hiltonheadgaragedoors.com or call (843) 645-0691.
Who Will You Be For Halloween?